Elizabeth Bathory was a Hungarian countess from the renowned Báthory family. The family is famous for defending Hungary against the Ottoman Turks. She is possibly the most prolific female serial killer in history and is remembered as the "Blood Countess" and as the "Bloody Lady of Čachtice", after the castle near Trencsén, in the Kingdom of Hungary where she spent most of her adult life. Elizabeth Báthory was born on the family estate in Nyírbátor, Hungary, and spent her childhood at Ecsed Castle. She was highly intelligent, and as a young woman learned Latin, German and Greek. She was also interested in science and astronomy. At 15, Báthory was engaged to Ferenc Nádasdy and moved to Nádasdy Castle in Sárvár. 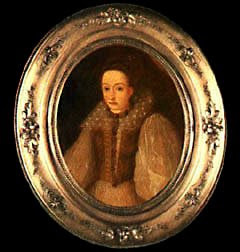 She married Nádasdy in Vranov in 1575. Nádasdy’s wedding gift to Báthory was his home, Čachtice Castle, situated in the Little Carpathians near Trencsén, together with the Čachtice country house and 17 adjacent villages. The castle itself was surrounded by a village and agricultural lands, bordered by outcrops of the Little Carpathians. She kept her name because her family was more powerful than her husband's. Báthory's husband was a military leader and therefore traveled a lot. Nádasdy died in 1604 at the age of 47. His death is commonly reported as resulting from an injury sustained in battle. Bathory had five children, two dying at a early age. Janos Thurzó went to Čachtice Castle on December 30, 1610 and arrested Báthory and four of her servants. They were accused of torturing and killing hundreds of virgin girls and young women, with one witness attributing to them over 600 victims. Thurzó's men reportedly found one girl dead and one dying. Another woman was found wounded and others locked up. It was determined that a trial or execution would be damaging to the nobility so a trail was postponed indefinitely and Bathory was sentenced to house arrest. Bathory's four servants were tried and convicted. Two had their fingernails ripped out and their bodies thrown in a fire; another was beheaded before being thrown to the flames and the last was sentenced to life imprisonment. Bathory was walled up in her castle until her death. She was found on August 21, 1614 but since there were several plates of uneaten food, her actual date of death is unknown. She was buried in the church cemetery of Csejte but upon villager outrage, her body was re interred in Nagyecsed, Hungary in the Bathory family crypt. The case has led to legendary, but false, accounts of the Countess bathing in the blood of virgins in order to retain her youth. These stories have led to comparisons with Vlad III the Impaler, on whom the fictional Count Dracula is partly based, and to modern nicknames of the Blood Countess and Countess Dracula. Suggest a story for "The Stull Chronicles".